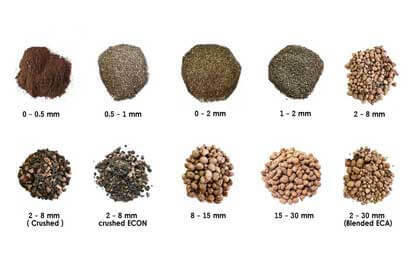 Expanded Clay Aggregate (ECA) is a granular lightweight aggregate that is obtained by firing special mining natural clays to a thermal expansion and vitrification (clinkerisation) process at 1200°C. The granules have a lightweight internal cellular honeycombed structure with interconnecting voids which results with good insulating properties. This is enclosed within a compact, strong external shell that provides an excellent weight/strength ratio, making the product suitable for a wide range of geotechnical, infrastructure, and construction applications. Expanded Clay Aggregate (ECA) is also a durable and incombustible material that is fire and frost resistant, thermally insulating, and sound-absorbent. It is 100% reusable and recyclable. Expanded Clay Aggregate (ECA) being a light weight versatile material offers the community of construction professionals worldwide to choose lightweight insulating products for use in construction, sustainable renovation projects, and complex engineering projects.